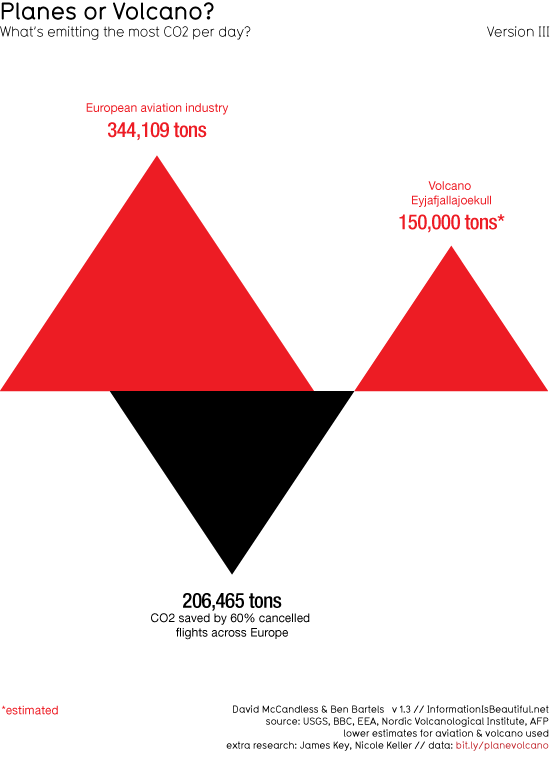 Volcanoes just aren’t that large a source of CO2. Via Information is beautiful. UPDATE: The other question that keeps popping up about the Eyjafjallajokul eruption, is its potential cooling effect on the climate. So can we expect cooling? Not likely, according to Rutgers University environmental sciences professor Alan Robock, an expert on how volcanoes alter the composition of the Earth’s atmosphere. 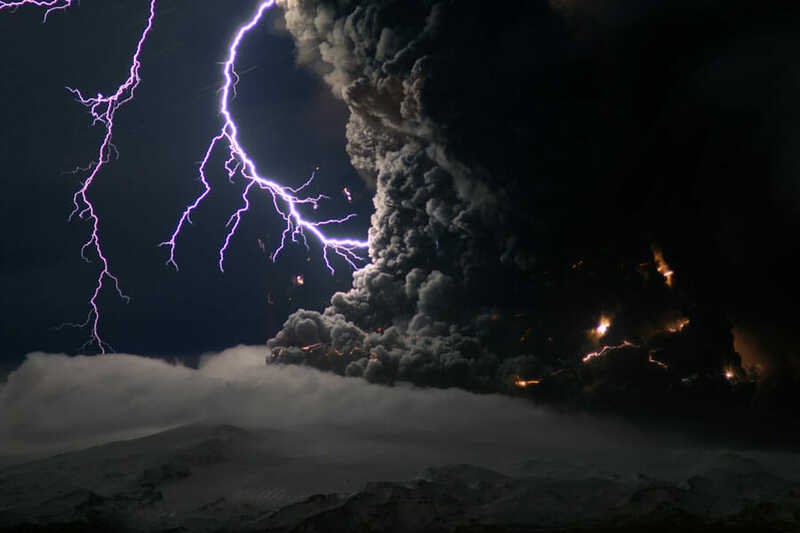 According to Robock, the Icelandic eruption hasn’t contributed enough sulfur dioxide to the upper atmosphere to significantly alter the climate. Robock noted that the ash cloud that is cancelling flights would not alter the climate, since it will fall out of the air in a matter of days. “What’s dangerous for airplanes is not what causes climate to change,” he said. UPDATE 2: The figure over at Information is Beautiful has been updated. It turns out Eyjafjallajökull is emitting more CO2 that we thought, though that amount is still dwarfed by our emissions. Remember the figure only shows GHG emissions for the European aviation industry, which represents 3% of European emissions. And European emissions represent 8% of global emissions. Or in other words Eyjafjallajökull represents about 0.004% of global emissions. 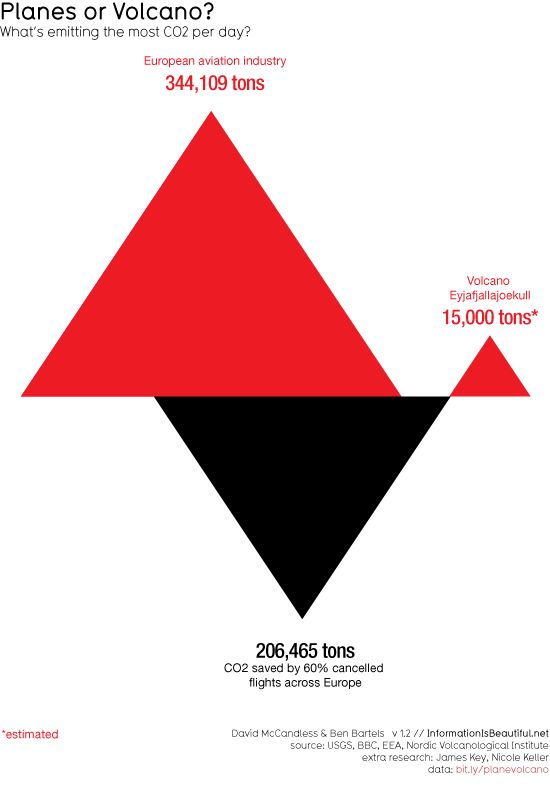 No matter how big this eruption may seem, its output of CO2 is dwarfed by our own GHG emissions. Going back to the “Information Is Beautiful” you will see that it is estimated that Eyjafjallajokul is putting into the atmosphere only 3,000 tons of SO2 per day. Pinatubo put 17,000,000 tons over the course of its 1991 eruption. Eyjafjallajokul would have to erupt for quite a while to match that. Pinatubo also had the benefit of being closer to the equator where the sulfates would be more evenly distributed. Volcanoes at higher latitudes tend to have less of an effect on global temperature. And even with Pinatubo, it tended to have far less of an effect on global temperature in 1991 as it erupted in July — and had more of an effect in 1992. Reminds me of El Nino — where the effect upon global temperature tends to lag the phenomena by roughly six months — as it takes a while for the warm surface water to become more dispersed and thereby have a greater warming effect upon the atmosphere. Eyjafjallajokul won’t have much of an effect. Katla (a neighboring, far more powerful volcano) might if it erupts. There is some worry that Eyjafjallajokul might trigger an eruption by Katla. I guess we’ll see what happens with that, though. I read something about past eruptions of Eyjafjallajokul triggering an eruption from Katla. Definitely interesting, just not in terms of long term climate trends. I believe flood basalt supervolcanoes are in short supply. Pinatubo only affected things for a couple years or so. About all we can expect without something truly catastrophic.